The UK would be "less attractive" to Japanese investors if it votes to leave the European Union, Japan's prime minister has said. Shinzo Abe said Japan's business sector saw the UK as a "gateway" to Europe. The UK will go to the polls in a referendum on its EU membership on 23 June. Matthew Elliott, the chief executive of Vote Leave campaign, said he did not accept Mr Abe's "do as I say, not as we do attitude". Mr Abe - who made his comments during a joint press conference in No 10 with Mr Cameron - said Japan would rather negotiate a trade deal with the EU as a block, rather than "individual states" in Europe. He also said Tokyo would be paying "very close attention" to the outcome of the EU vote, adding that more than 1,000 Japanese firms had invested in the UK, creating 140,000 jobs. However Mr Elliott said Japanese bosses argued that the UK would be diminished if it didn't join the euro "so similar warnings about the referendum further lack credibility". 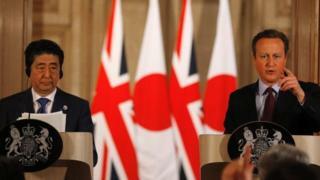 Japan "would not accept the huge loss of control Britain has suffered because of our EU membership," he said. "The EU has a terrible record negotiating trade deals yet we've handed power over our trade to Brussels and that's on top of the £350 million we pay the [European] Commission every week," he added. Mr Abe's comments echo the sentiments expressed by US President Barack Obama during his visit to the UK last month, when he said Britain would go to the "back of the queue" for trade deals with the US if it votes to leave the EU. At the time EU exit campaigners said his comments were "hypocritical", saying the US would never enter into an arrangement that reduced its sovereignty.